The increased demands of a growing population inevitably placed significant strain on the island’s ageing water supply network. In addition, the inability of these facilities to guarantee the removal of mineral deposits from the raw water led to an escalating number of complaints about discoloured water. With something in the region of 60% of the IoM’s drinking water coming from a single ageing WTP – Douglas’ Glencrutchery Works – replacing this plant was of clear national strategic importance. In October 2004, 70 years after the plant it is to replace was constructed, planning approval was obtained for a new facility at Homefield Road. The official opening of the new Douglas WTP in May 2008 marked the end of a three-year scheme of work which saw the plant finished ahead of schedule and on budget. 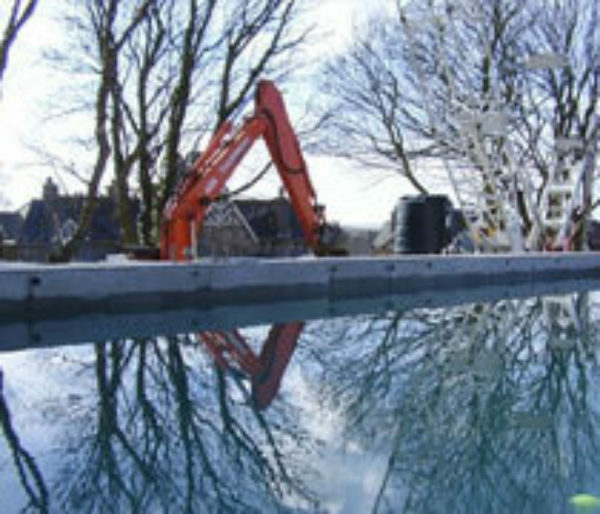 Douglas Water Treatment Works has completely transformed the quality and supply of water to thousands of homes and businesses in the Isle of Man. Working in partnership with the Isle of Man Water Authority and Earthtech Engineering, the Lagan Construction team delivered the design and construct civil engineering and building work for the £26 million plant. The new plant treats up to 37 million litres of water daily and supplies properties in Douglas, Braddan, Laxey, Onchan and across the south. Combined with the new treatment plant at Sulby, the two facilities have the capacity to supply the local projected population to the year 2021. The new plant uses a three-stage Dissolved AirFlotation (DAF) process which efficiently removes coloured particulates from raw water and requires less pre-treatment, thereby lowering chemical costs. It requires smaller tanks and vessels to clarify large volumes of water, leading to reduced construction costs. Other benefits of this system are that chemical costs are also typically lower as flotation generally demands less pre-treatment to form a light, small floc. The sludge solids produced from this process will be distributed to local farmers for agricultural purposes. The site is located in a largely residential area, near to the Isle of Man College. Accordingly, both the design and construction techniques chosen reflected the need to minimise disruption to neighboring residents. The 3 new buildings to house the plant were constructed partially below ground level to reduce the overall height and provide additional acoustic shielding. The plant was integrated into the Island’s central telemetry system and a variety of sustainable design features were also incorporated including sun pipes and grey water recycling.